WHO AM I – WHO ARE WE? My name is Sub-Deacon Michael Boyar, grandson of the reposed Very Reverend Lukian Steciuk (OCA - Canadian Archdiocese), son of Sub-Deacon Peter and Sonia Boyar (of Ss. Peter and Paul Cathedral in Detroit - OCA); husband of Tanya Mitrofanova; father of 4 children (Patricia Ann/34, Diane Marie/32, Vsevalod Igor/26 and Alexandra Nina/13); and grandfather of 9. I was ordained to the Sub-Diaconate by His Eminence, Archbishop SERAPHIM (of the same Canadian Archdiocese) in September 2006 after working diligently for several months helping to reopen St. John the Divine Orthodox Church (Windsor, Ontario) which had been closed for several years. Previously, +SERAPHIM did give me permission to pursue my dream towards Holy Orders (before his personal crisis) and I do not want to bother him about it now with everything he is facing. I pray for him – A Lot! This permission allowed me to begin my Seminary training at St. Arseny Seminary in Winnipeg, Manitoba, where I am a registered correspondence student, but I never completed a college/university program and have no formal degree so I do not know how far I will be able to progress through the program. In 2005, we organized and started meeting regularly as a group to look at how we could serve and spread the word of the awesome opportunity we have to grow in our own Orthodoxy. We wanted to find the best way to minister to our family, friends and other Orthodox Faithful in our area. We also realize that there are many people who are looking for the true light and seeking salvation, as well. After several meetings, research study sessions and prayer, we were initially guided to and granted an interview with the OCA Midwest Diocesan Dean to explore the possibility of forming a mission parish station. It was during our research, that we discovered St John the Divine Orthodox Church (my Grandfather’s parish that he served at in Windsor, Ontario) had been closed for several years. After contacting (then) Bishop SERAPHIM and presenting a Condition Report of the church/property and an Action Plan, we were given a blessing to reopen the church, and by the Grace of God, had our first Divine Liturgy on Christmas Day - and we never looked back! We served Reader’s Services for several months with occasional Liturgies when we could, but most fascinating was Holy Pascha when our assigned priest for the service got hurt and cancelled on us Saturday afternoon. That night – Our Holy Pascha - turned out to be one of the best experiences my family and so many others enjoyed. A few months later, Archbishop SERAPHIM and his chancellor, Fr Dennis Pihach (now Archimandrite Alexander) and several clergy from around Canada and the US came to celebrate the church’s 92nd Anniversary. Included in all of the festivities, we had a Baptism, a Christmation to Orthodoxy, and Vladyka unexpectedly ordained me to Sub-Deacon. We also met Fr Deacon Dean Katsilas (in the Romanian OCA) from Windsor, who came to help. On January 1, 2007, Fr Dean was transferred to us, ordained to the priesthood and assigned to Windsor. The church and parish commitment there is growing at a wonderful rate of cradle and converting Orthodox, and now has more people coming weekly than seen in several years – approximately 25 families now. Once we felt that the Windsor parish was in good hands and momentum was positive, our Mission Core Group decided to return to our area to develop an Orthodox community near our homes. This entire spiritual story was published in “The Orthodox Church” magazine and is still illustrated on their website (stjohnwindsor.org). Now, as a Sub-Deacon, and through a developed tremendous friendship I enjoy with Rev Gregory Joyce (of ROCOR), and with permission of Vladyka SERAPHIM, Fr Gregory and I petitioned His Grace, Bishop PETER of ROCOR to allow us to organize a mission parish, and with his blessing, started All Saints Orthodox Mission Church. We had our first Reader’s Service on All Saints Holy Day (June 3rd) with 14 ½ people in attendance, and for several months afterwards we served in a different Community Centers, had several services under a tent at various parks and at people’s homes. Fr Gregory celebrated our first Divine Liturgy on August 18, the actual day my youngest granddaughter was born. We advertised a lot and spread our message by word to anyone who would listen and were growing. One day, we were approached by Holy Ascension Serbian Orthodox Church in Ecorse, Michigan. OUR SPECIAL WORK WITH THE SERBS! They had reduced to a small handful of people and no rector. With the blessing of both bishops (+PETER and +LONGIN), we sat down with the few people there and created a very nice, but small community of about 25-35 faithful attending Reader’s Services weekly, a Divine Liturgy monthly, and had several activities (including classes for folks interested in Orthodoxy, a Lenten Series after our version of Presanctified services, and another Pascha without a priest. We had a One Year Anniversary Divine Liturgy and picnic, as well. Everything is still featured in this website: AllSaintsOrthodoxChurch.org. This whole ordeal was exciting and we talked often about merging our 2 communities on a more permanent basis, but the Serbian leaders thought that Holy Ascension was strong enough to stay open on their own and assigned a Full Time Rector who is still serving regularly now (Fr Andrei Alexiev) on a part time basis, so we started to focus on the Ss Peter and Paul Orthodox Cathedral Detroit – OCA after hearing about the hardships there. My parents, Sub-Deacon Peter and Sonia Boyar are very active at Ss Peter and Paul. My father is in the church office everyday (volunteering all office duties – now 30 years, creating/publishing the weekly bulletin), first responder to all emergency calls, on the Church Council and in the choir; and my mother was the secretary of the Ladies Altar Guild, volunteers where needed, and in the choir, as well. She also purchased more bonds for the Banquet Hall renovation project there than anyone else. My maternal grandfather (the one from Windsor), was an associate pastor in the 1950’s here, too. When we arrived, we found Ss Peter and Paul in a terrible situation. As you may have heard, the Rector decided that the church needed to renovate the Banquet Hall building (originally built in the 1920’s) with a half million dollar plus investment. This old outdated 2 story building on a side street in a poorer district of the city has a parish demographic that has been declining for several years now. Scandals ensued and then an abrupt retirement by the rector; an empty hall (that was not marketed, advertised or sold, and many people fighting and leaving the parish, but still with a monthly obligation of over 7000 dollars per month. I requested an audience with Archbishop JOB to explain what I wanted to do, and how I intended to get it done. He agreed to meet me (together with my father and the Council President) in Rives Junction, and he seemed really excited after the presentation and the prospect for success. (Since I was attached to the Canadian Archdiocese, and didn’t want to be released from +SERAPHIM, we agreed that I could be put “on Loan” to the Midwest Diocese and Ss Peter and Paul and instructed to work directly with/for +JOB (and his Proto-Deacon Joseph Matusiak), but under these circumstances, I could not be an actual member of the parish. These terms were acceptable as long as I can work through/for Vladyka JOB. I asked the Church Council to convene (off site), and presented them with an Action Plan to reorganize themselves. Since the rector asked many of the Council members to also leave (and they listened to him), it was like a lame-duck session. I was met with a lot of cynicism, but I wasn’t discouraged. Arrangements were made for a substitute priest to serve the first week after he left, so I took that opportunity to meet with the people as a whole. Since most (if not all) of the people knew me, I just needed to build morale and present my ideas. It went really well – and we were off and running! We began structuring a new, positive image. We made church exciting and every week was better than the last. We coordinated a couple of events and became excited about our future. Even the “negative grumpathas” were beginning to get into it. We created a monthly E-Newsletter, negotiated a website (with Fr John Parcells – OWS) and then bought stamps and sent paper versions of newsletters/information to people without computers. My family sponsored the first of many monthly Family Dinners in February, and made it about love. Ss Peter and Paul was talking about love – So soon after so much pain. It was Unbelievable! Thank God! We started our “New Attitude” in November, 2009 and continued with as many services as we could. If there was no priest available, we did a Reader’s Service – even on weekday Holy Days; and then enjoyed coffee and a special treat for coming to church. Each month, we tried to have a Social Event (relating somehow to the church calendar), and a monthly Family Dinner, sponsored by a different family, using the “good china” and spoiling ourselves with a delicious menu. Everything was always Good Will offering, so that you pay what you want and can afford – even if it is nothing. That’s ok! A few weeks later, I invited +JOB to come and check out what is happening here, and he accepted. He said he was totally amazed at what he saw. It was truly a miracle! The plan is actually simple: I believe that we all have Our Circles of Friends, including Our Neighbors, Our Work/School peers, Parent Clubs, Community Centers, Sports, Music, Hobbies, and of course, Our Family Groups; so to have our special circle of friends at Church is a slam dunk! As much as we need God and everything that Orthodoxy provides us, we need each other and to develop a social community of our Orthodox Family and Friends. To give you an idea, in December, we concentrated on cleaning the temple thoroughly and decorating with as much color and lights as possible. The place looked amazing! We also wanted to do something special for the neighborhood, so we organized a special date for COOKIES WITH SANTA. We were lucky to have a Mexican gentleman to play our bi-lingual Santa Claus, for the many children (and adults) who came to visit him from the parish and the neighborhood. In January, we had “DINNER AND A SHOW” featuring our church school children’s YOLKA in performing the Nativity of our Lord, after they served dinner to all the folks who attended. In February, we started with a SOUPER BOWL brunch and contest, and again our Family Dinner on Valentine’s Day. In March, we had our annual BLINI BRUNCH on Forgiveness Sunday and a quite impressive RUMMAGE SALE (first one in several years). Everything was PASCHA IN APRIL, including teaching the art of PYSANKY and an exquisite dinner on Palm Sunday. People worked hard cleaning and decorating for the Holiest of Holy Days, and it showed! In May, we had our CHURCH SCHOOL GRADUATION (with announcements for the bigger kids), and a first class Dinner to celebrate. June was Pentecost and one gigantic BIRTHDAY PARTY to celebrate everyone’s birthday – including the church. In July, we had our first CHURCH PICNIC in many years, right in the courtyard of the school. With hot dogs, hamburgers under the big tent, and tricycle races, it was fun. August was nice as we enjoyed The Holy Transfiguration as a FRUITFUL EXPERIENCE, and celebrated a new baptized parishioner and wedding plans. In September we did FROM RUSSIA – MADE IN MICHIGAN, and our annual MOVIE MANIA. Our Church School program kicked off another year. October was very special, because we started the month by actually pulling off a FIRST CLASS FESTIVAL, with music, dancing, food, games and bouncers, a petting zoo and pony rides, and we had the Fire Department here with their Smoke House (to teach kids what to do in a fire), various organizations to help with the needs of the neighbors, church and school tours, souvenirs, raffles, and PAWS – mascot of the Detroit Tigers. 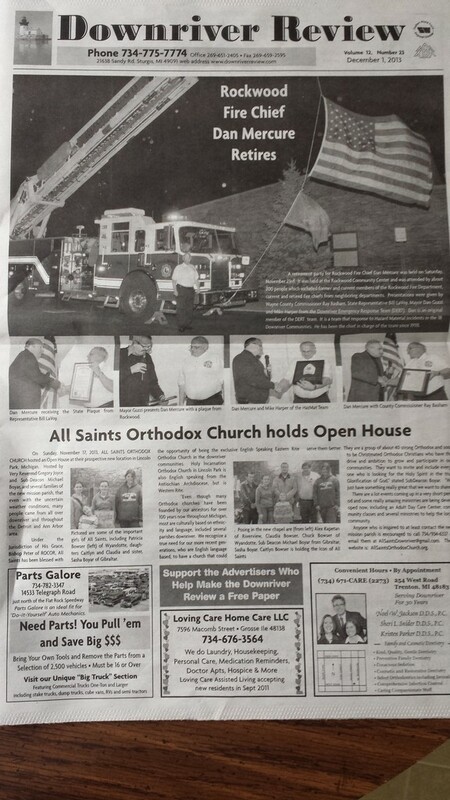 A couple of weeks later, we celebrated OUR FOUNDER’S DAY celebration honoring our 102nd Anniversary as a parish - The First Orthodox Parish in Michigan. We also got involved with various organizations in the neighborhood (IE: Michigan Avenue Business Association, Southwest Detroit Business Association, City of Detroit Election Bureau, and by invitation of +JOB, I attended the first Urban Parish Summit in Cleveland, Ohio). We reactivated the Ladies Altar Guild, St Nicholas Men’s Club, and worked on plans for an updated Library and Bookstore. This was just One Year! People were watching from outside and from everywhere. One priest even commented that it was like “A Breath of Fresh Air” watching the church grow again. Fr John Matusiak published our successes in “The Orthodox Church” (again), and even contacted me about a follow up a few months later. As the General Manager of the Ukrainian Cultural Center in Warren, Michigan, I discovered Holy Trinity Ukrainian Orthodox Church, a little parish in Dearborn, Michigan. Like the Serbs, they are a small and aging parish in a part of the city that is hard to minister to. They were going through a crisis, with some major citations from the city regarding their physical property and a very small group of less than 10 to figure it out. We suggested and implemented some simple programs to get through the tough times they were in the middle of, organized a fund raising banquet and spread the word throughout the Ukrainian and Orthodox Communities (not the same thing), held a couple of Reader’s Services, while Fr Andrew Rogers had to be away to increase exposure (and test our own presence), and very recently, even did a presentation of an Action Plan on how to grow. The reinstatement and survival of All Saints Orthodox Mission Parish is very important now, because some of our people are in need of the spiritual love and guidance only available in Orthodox Christianity, and within our own family setting. Even though we have done some great work helping several other parishes, I unknowingly led us away from ministering to our own adults and teaching our children. It’s an important time for us now! I had to realize that many of these parishes needed to tend to their needs and solve their own problems. I am proud that we were able to help, but it is our time now. I am realizing a count of as many as 50 people are committing (on different levels) to our ministry, and we are back on a track to be with each other – for each other. Here is a link to a story that the major downriver newspaper, The News Herald wrote about us as their Religion section Feature. You can also get a hard copy by buying their newspaper this week before their Wednesday edition comes out. It costs 2.00. Shanon Rossi is a free lance writer for the newspaper and really took the time to talk to Fr Gregory and me, and I think she did a really nice job. Please read it and share your thoughts, too. Please watch for us in future articles and in their Under the Spires catagory. We will participate with them whenever we can. This is such an exciting, yet important time in the life of this new mission. Please Pray for us, too. 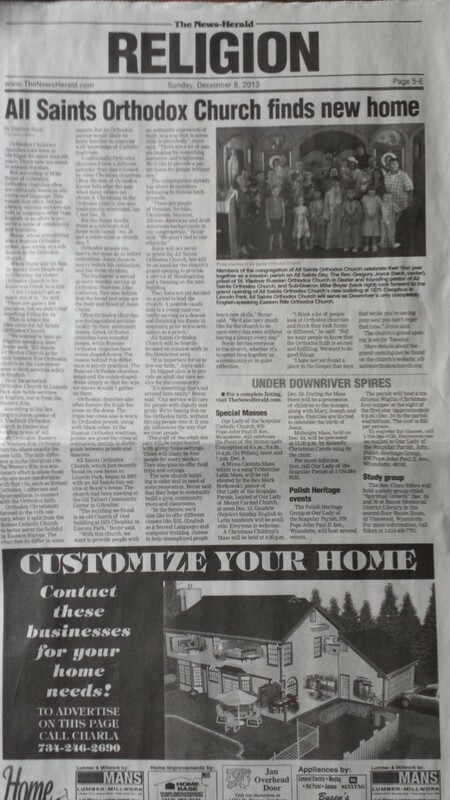 Here is a copy of The Downriver Review December 1, 2013 issue. Thank you so much Greg (Editor) for a wonderful article. The newspaper is available throughout the Downriver area and is distributed for Free at newsstands everywhere. We went to the website, but could not locate a link, so pull up the photo and you should be able to read it from there.